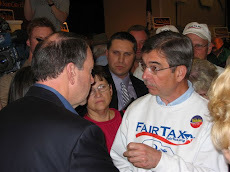 As most of you know several members of FairTax NJ have made applications to attend the Huckabee Show in NYC. Below is a report of the first such visit. I always tell people that this event is fun even if the FairTax was not involved. Other than meeting Governor Huckabee after the show - he personally greets every member of the audience - the best part is the other high energy people you meet like the ones described below that are the type of people you want to spend your life with rather than the chronic complainers & losers who make up "all the 'deadbeats' and 'hubcaps' out there that disappoint ya." Well, we had a great time and like you said the Fox studio treated us very well. 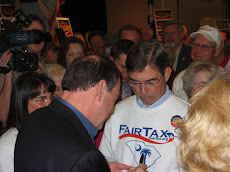 We all wore our FairTax stickers. I gave my unused spot to a teacher who had come in from PA and who was on stand-by. He was ever so grateful!! He was standing in line grading his papers with his book bag at his feet. I struck up a conversation by saying that I remember "those days".... with the ever-present book bag loaded with papers to grade! Anyway the spot didn't go to waste as I had thought it might. We met so many friendly folks there and talked a lot about the FairTax. I met a 71 year old pilot who used to fly candidates around and had got to know the Huck. He was there from Ohio with his wife, 2 granddaughters and a friend and his wife. All had come to NYC just to see the show! Ditto for the folks from TEN and GA. They didn't come to NY to see the sights... they came just to see the Huck show! It's amazing! ... For all the "deadbeats" and "hubcaps" out there that disappoint ya, there are these people that spend their $$ and time to come see Mike Huckabee. We are in the audience, second row; 3rd & 4th seat from the end on the left. I don't know how you can sit in the audience and listen and not pop those two in the nose. Did you notice their tactics to keep talking so no one else can answer. Did not see you, were you close to the lady that Meat Loaf sang to at first?